Summerlin is showing it will be a factor in the Las Vegas housing market for years to come as it continues to rebound from the recession. 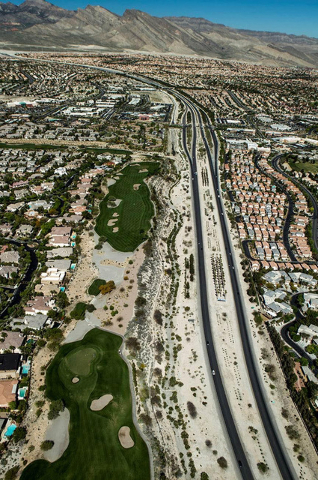 Summerlin, a 22,500-acre master-planned community in northwestern Las Vegas, finished fourth nationwide for home and lot sales during the first six months of 2016, reported RCLCO, a housing consultant surveying master plans nationwide. The 366 sales in Summerlin so far this year are up 12 percent from the 327 sales through the same period a year earlier. Summerlin wasn’t in the top 10 from 2008 to 2012 amid the recession. It was 25th as recently as 2011 and reached 12th in 2012. In 2015, it ranked No. 6 with 602 sales. That was up 37.8 percent from 437 sales in 2014. Summerlin opened in 1990 and ranked No. 1 in sales 11 times between 1992 and 2003, peaking in 2000 with more than 3,200 sales. It remained in the top 10 from 2004 to 2007 before dipping. “This newest 2016 mid-year report speaks volumes about Summerlin’s remarkable and enduring success as it leads new home sales in Southern Nevada, even in its 26th year of development,” Summerlin President Kevin Orrock said. There are no other master plans that compare to the total package that Summerlin has to offer, said Dennis Smith, president of Home Builders Research, which tracks the housing market. That was echoed by RCLCO in its rankings by citing the October 2014 opening of Downtown Summerlin, some 1.4 million square feet of retail and 30 restaurant options. When completed, it will have 125 stores and restaurants, a hotel, multifamily housing and office space. A practice hockey rink for Las Vegas’ new National Hockey League franchise will open nearby. “All of the other master plans would like to be like Summerlin,” Smith said. “They either don’t have the size or are not willing to put in the amenities that Summerlin has been able to develop over the years. Summerlin has been building on this total package since it started. They have had time to refine and supplement and omit whatever needs to be done on improving the package. Summerlin has more than 100,000 residents, and some 7,000 acres remain to accommodate future growth. It has more than 150 acres of parks, 150 miles of trails, 22 schools, and nine golf courses. New amenities this year include Doral Academy, a public charter school offering grades kindergarten-through-9 is opening for the 2016-17 school year. A public indoor aquatic center was added in the community’s southern portion. The Summit Club, a 555-acre country club community that’s a joint venture between The Howard Hughes Corp. and Discovery Land Co., recently announced customers are closing on 72 of its 140 custom lots up for sale with average price of more than $3 million. It will open in 2017 with a Tom Fazio-designed golf course. Some custom homes are expected to cost in the $10 million to $20 million range. Leasing is underway from the Constellation, a 124-unit gated rental luxury development in Downtown Summerlin. Orrock said eight neighborhoods opened in 2015 and there are five new ones in 2016. Summerlin has 22 actively selling neighborhoods in four villages with 90 floor plans ranging from 1,849 to 5,904 square feet. Neighborhoods opening in 2016 include a second custom-home neighborhood in The Ridges village along with five neighborhoods in The Cliffs and The Ridges villages. Among these is Regency by Toll Bros., the first active-adult neighborhood in Summerlin in 15 years, Orrock said. The average price of new homes sold in Summerlin over a six-month period ending March, 31, was $596,972, according to SalesTraq, which monitors the housing market. No other master plan was within $200,000 of that mark. In its midyear report, RCLCO ranked Inspirada in Henderson No. 9. It was unranked in 2015. Providence was No. 19, down from 13 in the 2015 midyear report. Mountain’s Edge, which was fifth for all of 2014, didn’t crack the top 20 the last two years.